New pool, bowl and vert footage from Flip’s Danish master. A burn PRODUCTION: “Down Under Days” With RUNE GLIFBERG from burn on Vimeo. Corbin Harris has been so excited about this dropping all week that most people who own mags around the world must have got the message twice. Not only does this have a slam in it that will make you wince (and prove that sometimes you have to take them to get what you want), there’s great skateboarding in this, tricks-a-plenty and a bizarre tent grind that will have you on the rewind. Good times. Etnies team riders Sheckler, Bledsoe, Rojo, Leeper, Ryan Pearce, and Nick Garcia all hit the road back in April to visit Australia’s parks and spots. Watch this video of the trip here. Every year, we wait for this video to drop as it’s always one of the very best road trips out there. 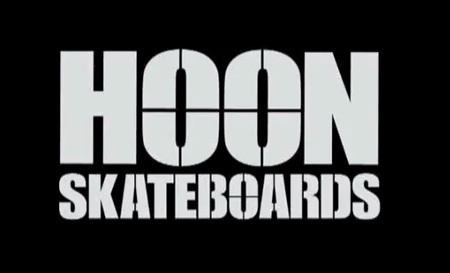 Get stuck into footage of this year’s run with the Hoon Skateboards team and their mates as they roll from The Gold Coast to Newcastle in Australia and hit up every park in their way. If you look down under right now and have a peep at the Australian indie scene, you are sure to find some unique acts that are bubbling away under the radar that have potential to cement their music into British culture. Whilst listening to the likes of Tame Impala and Metals this year, we came across some talent from Sydney who will soon have the world at his fingertips. A songwriter whose debut EP Hello Anxiety came packed with such high pedigree, that we had to delve further than usual to find out what makes this 5 track offering so addictive. 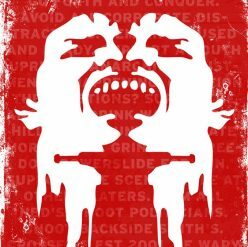 Welcome to a world of greatness that should hopefully reach UK shores in 2012. Welcome to the musical splendour of Guineafowl. 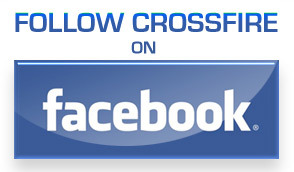 Welcome to Crossfire. What can you tell us about your debut EP ‘Hello Anxiety’ and what was the most Anxious moment recording it? Thanks for having me. The most anxious moment was being in an actual studio. Prior to recording the EP I had really only been recording at my house, which for the most part was home to zero microphones and next to no instruments. So recording in a studio with hundreds of mics and a massive mixing desk made me extremely anxious. Does this debut release title generally reveal to the world that you are generally a ‘man wreck’ (!!!) or could this be a way of actually relieving the stress of being a musician? I think the title has two implications. The first would be that to release one’s first artistic offering is an extremely nerve wracking procedure and therefore I have anxiety as a result of saying ‘hello’. The other one is that being in an artistic world will bring me personally more anxiety. Both are true, I am a man wreck. What is your process for creating these songs and what’s your studio set up? My process tends to change from song to song but I always write and record at the same time. My current studio set up is very advanced, a computer AND a microphone, but I am starting to acquire more instruments. I have being buying some second hand synths lately and they are allowing me to make some interesting and messed up sounds. Are there any hidden noises or instruments that came to be included on this EP by accident? Any sounds you will only know of and not us out here listening in? Actually there are quite a few. I lived in a pretty noisy house, so all the demo recordings used on the EP have back ground noises like buses, traffic and the sound of furniture being moved around coming from the antique store downstairs. The most blatant accidental noise can be heard on ‘Botanist’, my cat meows really loudly and then some keys fall off my coffee table. You can hear both really clearly in the opening few seconds of the song. Who are the artists that have inspired you to pick up an instrument and to being an artist yourself? My family. I come from a family of painters and so perusing art was something that if I were inclined that way to peruse. Picking up an instrument happened because I have always had a fascination with them and I have had a go at playing a range of them with varying degrees of success. Who are your contemporaries in the music scene out in Australia and who do you currently rate? Australia has a fantastic music scene; at the moment I am particularly enjoying music by another Sydney artist named Jack Ladder. He has assembled an amazing band and is playing some very dark, moody music. It’s excellent. How difficult was it to try and master speaking backwards on this latest video you have released? It was really difficult. I had to practice four to five times a week with the director of the clip leading up to the shoot, and recited lines on my own every day. We pretty much had to create a whole new language to get it right. If you had to collaborate with on a track, who would you choose? David Bowie immediately comes to mind. I just think he is one of the best writers of all time. His ability to push himself and his music is uncanny, and I would think that he could do the same for me. What’s the best advice you’ve ever received from a fellow musician? Tim Rogers, lead singer of seminal Australian band You Am I, once called me good looking, I guess that counts as advice. I have yet to be given bad advice, but as soon as I am, I will let you know. Who would be the top five acts on your ‘Fantasy Festival’ bill? The Cure, David Bowie, Talking Heads, Radiohead and Blink 182 (too much full on music needs to be broken up a little with some pop punk). Who would you throw egg rolls at, at the same festival if you had to pick a band that sucked the most in your opinion? In all honesty, even if I absolutely despised a band, like hated their songs and their playing and their outfits, I still would not throw something at them. I would just deflate their tyres before they left the show. 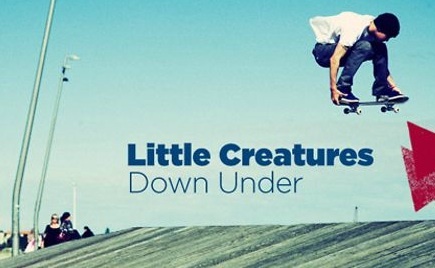 Did you grow up riding a skateboard at all? I used to skate a lot when I was younger. I wanted to get back into it recently actually and I took this deck that I had saved for when I was about thirteen, into a pro shop to get trucks on it. The pro took one look at it and said, “You should not skate this, it is a classic”. I was a late 90’s World Industries Flame boy deck with two very alluring devil girls on it. It is a wicked, wicked deck, but will forever remain on my wall. Which pro skaters are singing Guineafowl on their travels right now? I doubt any are singing me yet, but I once listened to EP mixes whilst playing Tony Hawk Pro Skater, does that count?! 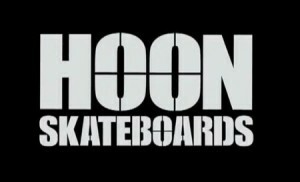 Any stupid skateboard related stories? I was once trying to jump some stairs outside a shopping centre in Sydney, when I slipped and the board went right through a glass door into the centre. I casually walked inside, picked up the board, bowed to several confused old ladies and then bolted. If you had to pick a fight with 2 dangerous animals what would they be and how would you finish them off in a battle? I would fight a Lion and a Rhino. They would so not be able to work together and eventually turn on each other, especially when I tell the Rhino what the Lion said about his wife. Thus leaving me to claim victory. 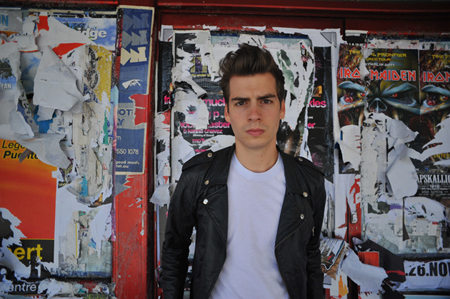 Lastly, when will you be playing here in the UK so we can chuck egg rolls at you? SOON!! I am planning to bring my band over at the end of the year. Don’t miss Guineafowl’s debut EP ‘Hello Anxiety’ that is out now on Dew Process Records Get a free download here. 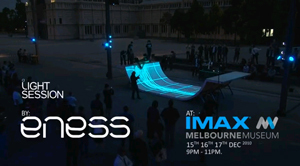 Melbourne based interactive designers ENESS were asked to create something to bring skateboarding fully into the digital age. Forget straight-to-itunes edit, what everyone really wants is a session where we replace the beers and dog piss with streaming neon lights and electronic fireworks. This session went down at the Tron: Legacy premiere in Melbourne, a film which you should probably go see. Because it’s awesome. As is the video below. Enjoy.